What Are Mobile Concrete Terms? What Is A Mobile Concrete Mixer? 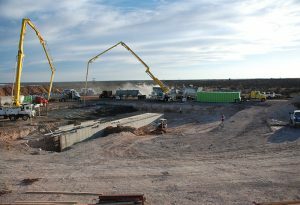 A mobile batch plant, or volumetric mixer, is a unit that can be taken to jobsites and used to produce concrete as needed to meet any specification. The units are predominately truck or trailer mounted and can be moved around the jobsite to pour when and where needed. Mobile batch plants are capable of making any type of concrete desired by adjusting the materials in the mix, and can change mix designs as needed. 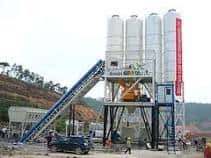 There is very little waste using volumetric mixers as a batch plant because only the amount of concrete needed for the specific task is made and this helps to alleviate the environmental issues of leftover concrete. At large jobsites, volumetric mixers can be continually loaded to have a continuous flow of concrete. As long as there is material in the mixer it can be mixed and poured as needed. Mobile batch plants also limit the emissions produced. While drum trucks must continuously run to keep their cement from setting, volumetric mixers create concrete on site, saving gas, the environment, and money. Also, a volumetric mixer can store around 9.5 m³ and a standard mobile batch plant will produce around 60 cubic yards per hour, although larger and smaller production plants are available. A traditional batch plant is typically located in a fixed location and is usually not near jobsite locations. This means there isn’t much flexibility for the load leaving the batch plant because the clock has started and the load should be poured within 90 minutes. When the concrete is batched, drum trucks are then used to deliver the concrete to the desired location. Traditional batch plants are typically either central batched, where the concrete is mixed in a large drum and then transferred into a truck for delivery, or transit mixed, where the materials are weighed and then loaded into the truck and mixed in route to the jobsite. Any leftover concrete at the end of the pour is typically the contractor’s responsibility and must be disposed of by paying to have it hauled off. The average traditional batch plant will produce 150 to 200 cubic yards per hour; however the delivery capabilities are limited by the number of trucks available for delivery. Want to learn more about how volumetric mixers can be used as batch plants? Contact a Cemen Tech Concrete Solutions Specialist or call 800.247.2464. Volumetric Or Drum, Which Concrete Mixer Is Better? ©2016-2019 Cemen Tech Inc. All rights reserved.